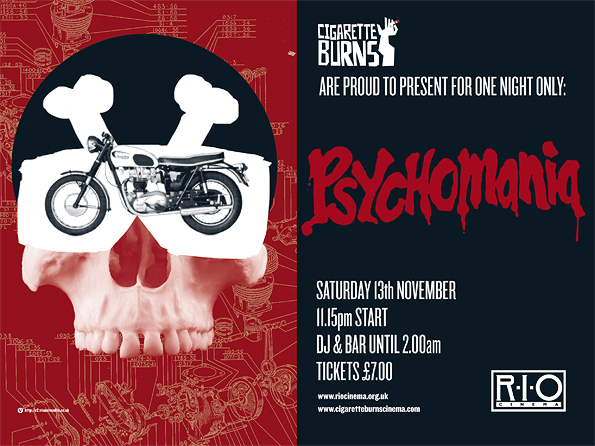 Because this Saturday we bring you Brit biker classic, Psychomania. Once again we’re back at the Rio, but with an extra special treat, Ed Zed, fellow founder of Cigarette Burns shall return and takes his rightful place. Just you wait, this alone will be worth it. Psychomania is the slightly out of time tale of a group of not too nasty bikers intent on eternal life. Lead by a man who speaks to floating frogs, they proceed to commit suicide one by one and upon their return wreck havoc on sleepy Walton on Thames. I kid you not. Out of time because being filmed post Night of the Living Dead you would expect much more from a gang of undead biker called The Living Dead, but no, why bother with such silliness as make up when all we are really after is some impressive bike chases and more and more inventive (if fairly bloodless) suicides. 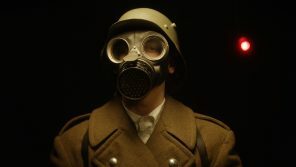 Graham of the magic treasure trove that is Flashback Records will be playing appropriate little ditties before and after the screening. Tickets are £7 each, you can pre-book here Fun kicks off at 11.15pm. Buses – 38, 56, 67, 76, 243, 242, 149, plus East London Line to Dalston Junction and the Overground to Dalston Kingsland all drop you off at the Rio’s doorstep and plenty of night buses back.